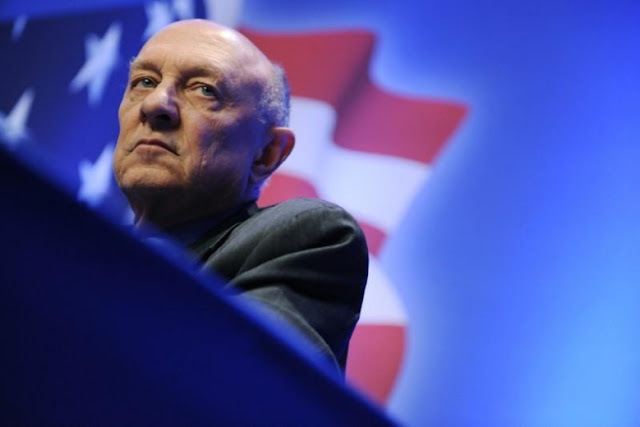 FILE PHOTO: Former director of the U.S. Central Intelligence Agency James Woolsey takes part in a panel discussion on Sharia law at the Conservative Political Action Conference (CPAC) in Washington February 12, 2011. WASHINGTON - Former CIA director James Woolsey pitched a $10 million contract to two Turkish businessmen to help discredit a controversial U.S.-based cleric while Woolsey was an adviser to Donald Trump’s election campaign, three people familiar with the proposal said. Just eight days after formally joining Trump’s campaign as an adviser on national security issues, Woolsey met on Sept. 20, 2016 with businessmen Ekim Alptekin and Sezgin Baran Korkmaz over lunch at the Peninsula Hotel in New York, they said. In an email memo seen by Reuters, Woolsey and Miller sketched a plan to “draw attention to the cleric’s possible role in the coup attempt” and encourage an official investigation into his activities. At the Sept. 20 meeting, Miller said she and Woolsey were in a better position than Flynn to influence decision-makers about Gulen’s alleged role in the coup, according to Alptekin and two other people familiar with the discussion. Bidding for a lobbying or consulting contract with a foreign company or government is not illegal, and Woolsey and Miller did not win the contract in any event. But the previously undisclosed meeting shows for the first time that two Trump aides were competing with each other to win the lucrative business deal with Alptekin. The deal is now being investigated by special counsel Robert Mueller as part of his wider probe into whether the Trump campaign colluded with Russians who tried to interfere in the 2016 U.S. presidential election. Flynn is a central figure in Mueller’s investigation because of conversations he had with then-Russian ambassador Sergei Kislyak last year and because he waited until March to retroactively register with the Justice Department as a foreign agent for the work he did for Alptekin. Flynn was fired as national security adviser in February after misleading Vice President Mike Pence about the extent of his conversations with Kislyak. Jonathan Franks, a spokesman for Woolsey and Miller, described the Sept. 20 meeting as “unremarkable” and said Miller could not locate the email memo or remember writing it. He also said Woolsey had pursued with Turkish interests an “economic development proposal in the wake of the coup that centered around reassuring folks that Turkey was a safe place to do business” but that the project’s focus was not on Gulen. Alptekin said Woolsey and Miller pursued his business at the Sept. 20 meeting, pitching the project to target Gulen, but he decided to stick to his contract with Flynn’s firm. Kelner declined to comment for this story. The disclosure in March of Flynn’s contract to discredit Gulen sparked intense media scrutiny of people who had worked with Flynn, including Woolsey. Shortly after, Woolsey alleged in media interviews that Flynn and others had, at a Sept. 19, 2016 meeting in New York, discussed with Turkey’s foreign and energy ministers the idea of covertly spiriting Gulen out of the United States and to Turkey. Flynn has denied through a spokesman ever discussing such a plan. Alptekin also denied it was ever discussed and said Woolsey’s claim was “all the more astounding” because he had sought Alptekin’s business at a meeting the following day. “His story is fiction,” Alptekin told Reuters. Franks said Woolsey stands by his account of the meeting. Woolsey first proposed the $10 million project to Korkmaz, the second Turkish businessman, at a meeting in California in August 2016. The proposal was outlined in an email sent from Miller to Woolsey on Aug. 18, printed out and shown by Woolsey to Korkmaz, who then forwarded it on to Alptekin. Korkmaz, who had known Woolsey for some years, invited Woolsey to the meeting, according to two people familiar with the meeting. Korkmaz told Woolsey that he was looking for someone who could handle a lobbying and public relations project related to Gulen. Korkmaz and Alptekin have no business ties but knew each other through a U.S-Turkey trade group, according to two people with knowledge of their relationship. Anil Leylek, a spokeswoman for Korkmaz’s company, declined to comment. Woolsey and Miller’s proposal included getting Washington insiders like then-Senator Jeff Sessions, who is now Trump’s attorney general, to co-author articles on the situation in Turkey, engaging with influential lawmakers such as Republican Senator Bob Corker, and getting Woolsey on Fox News and CNN, the memo said. “The cost of this engagement will be $10,000,000,” it said. Woolsey, who led the CIA for two years under former President Bill Clinton, joined the Trump campaign in September. He was on the transition team after Trump’s election victory in November but he stepped down in January. Franks said Woolsey was an unpaid adviser to the campaign, had no obligation to report any efforts to pursue work for Turkish interests, and was now being smeared. “With growing speculation that indictments could be handed down soon, it’s not a surprise that others are attempting to accomplish in the press what they cannot in the grand jury room,” Franks added. Former CIA director James Woolsey pitched a $10 million contract to two Turkish businessmen to help discredit a controversial U.S.-based cleric while Woolsey was an adviser to Donald Trump’s election campaign, three people familiar with the proposal said. Just eight days after formally joining Trump’s campaign as an adviser on national security issues, Woolsey met on Sept. 20, 2016 with businessmen Ekim Alptekin and Sezgin Baran Korkmaz over lunch at the Peninsula Hotel in New York, they said.